Product prices and availability are accurate as of 2019-04-17 18:29:13 EDT and are subject to change. Any price and availability information displayed on http://www.amazon.com/ at the time of purchase will apply to the purchase of this product. DW-SW7530-T5 is a gigabit Ethernet switch, of high performance and easy maintenance. The switch is dedicated to a high speed forward demand like schools, small business offices, tiny enterprises and other small places. With an attractive Mini desktop design, and 5ports,it is particularly suitable for small-size network. It also provides 5 10/100/1000 Mbps auto-negotiation ports, and supports automatic MDI/MDIX. These gigabit ports can not only be used as ordinary ports, but can also cascade to other network devices throught UPLINK port. 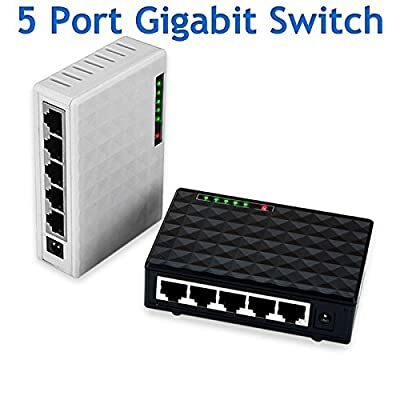 In full duplex mode, DW-SW7530-T5 can be used to replace the 10, 100 Mbps switch, to solve the bottleneck problem of the server terminal connection.